In 2016, CO₂ levels in the atmosphere grew by 3.36 ppm (parts per million), a new record since 1959 and much higher than the previous record set in 2015. 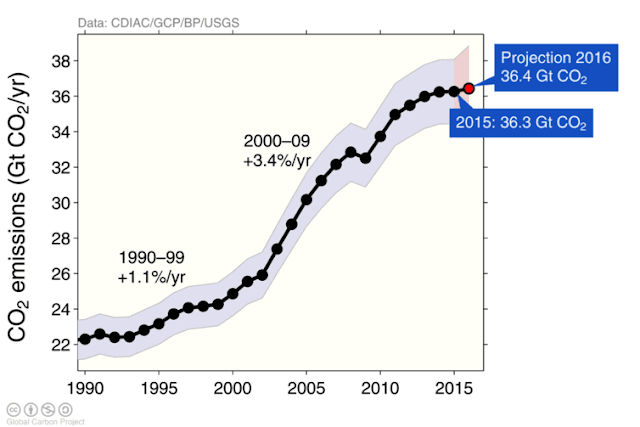 Worryingly, above graph has a trendline added pointing at a growth rate in CO₂ levels of 6 ppm per year by 2026. Growth in levels of CO₂ in the atmosphere is accelerating, despite reports that - for the third year in a row - carbon dioxide emissions from fossil fuels and industry (including cement production) had barely grown, as illustrated by the Global Carbon Project image below. 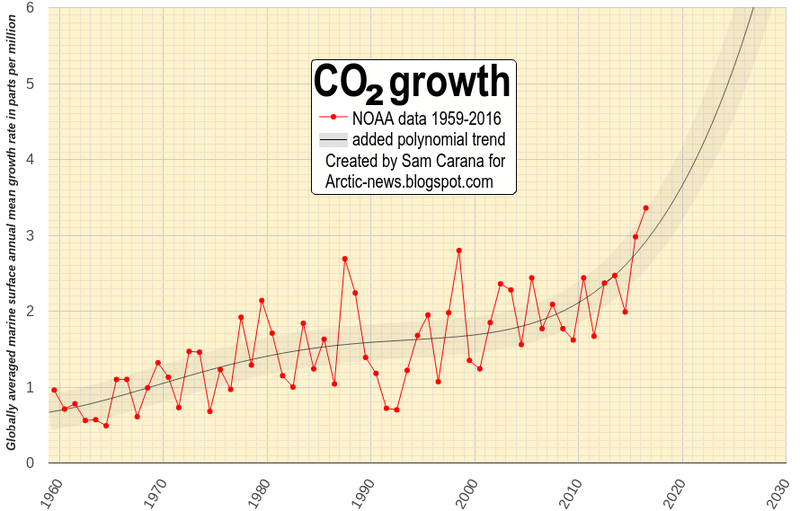 Why is growth in CO₂ levels in the atmosphere accelerating? Agricultural practices such as depleting groundwater and aquifers, plowing, mono-cultures and cutting and burning of trees to raise livestock can significantly reduce the carbon content of soils, along with soil moisture and nutrients levels. The recent jump in global temperature appears to have severely damaged soils and vegetation. Soil carbon loss and enhanced decomposition of vegetation appear to have occurred both because of the temperature rise and the resulting extreme weather events such as heatwaves, drought, dust-storms and wildfires, and storms, hail, lightning, flooding and the associated erosion, turning parts of what was once a huge land sink into sources of CO₂ emissions. 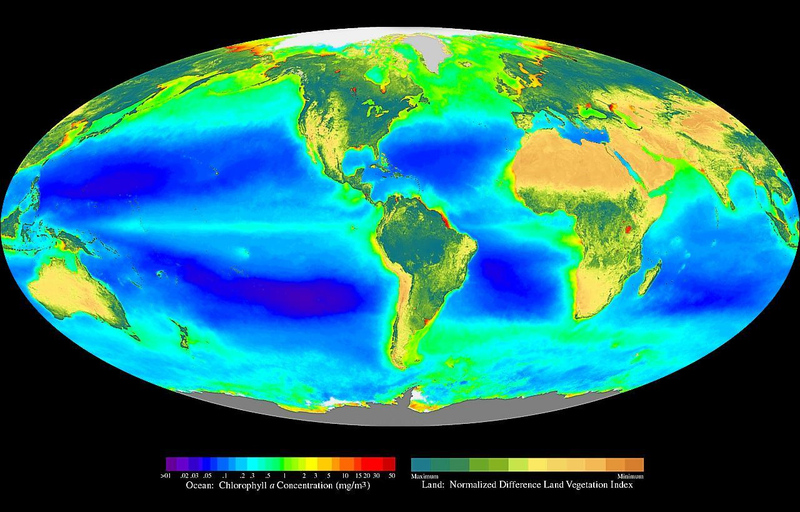 Moreover, extreme weather events can also lead to emissions other than CO₂ emissions, such as soot, nitrous oxide, methane and carbon monoxide, which can in turn cause a rise in the levels of ground-level ozone, thus further weakening vegetation and making plants even more vulnerable to pests and infestations. Meanwhile, research including a 2014 study by Franks et al. concludes that the IPCC was too low in its estimates for the upcoming temperature rise locked in for current CO₂ levels. A study by Friedrich et al. updates IPCC estimates for sensitivity to CO₂ rise, concluding that temperatures could rise by as much as 7.36°C by 2100 as a result of rising CO₂ levels. When also taking further elements than CO₂ more fully into account, we could face an even larger temperature rise, i.e. a rise of 10°C (or 18°F) by 2026 (compared to pre-industrial), as further described at the extinction page that specifies the different elements of such a rise, including a 0.5°C rise due to CO₂ emissions from 2016 to 2026. The CO₂ growth discussed in this post appears to be in line with such a rise and in line with the associated loss of carbon sinks and rising vulnerability of carbon pools. 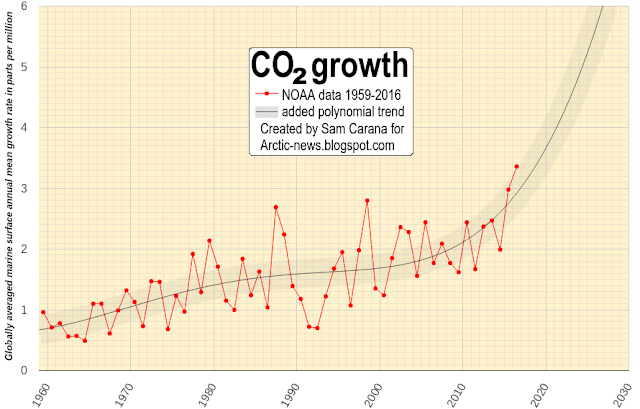 The situation looks particularly threatening in the Arctic where many of the most vulnerable carbon pools are located, where temperatures are rising fastest and where CO₂ levels have recently risen rapidly (see image below with CO₂ readings at Barrow, Alaska). Also note the recent rise in methane readings at Barrow (image below). His Sam, what data did you use for CO2 levels increasing by 3.36 ppm in 2016?